You may have heard the terms Vata, Pitta and Kapha thrown about by myself and other people online. But what does it all mean and how can these three strange words completely transform your life? My goal for the Ayurveda Series 1 is to totally empower you to own your body type. You are unique and beautiful and you will learn in this series all the pros and cons of each body type. This information has transformed my entire world, and it will for you too. Today we are going to focus on the Vata body type, also known in modern science as the Ectomorph body type. Ayurevda Series 1 – What Is Your Body Type? Don’t do well with very high intensity or longer exercise sessions. They have to be gentle with their body. If you are Vata/Ectomorph, enjoy your beautiful lean body, but understand that being lean comes at a cost so you need to stay balanced. You don’t have the resilience or immunity of a Kapha, so if you want to stay healthy and happy you need to learn how to stay balanced with practices such as meditation, yoga, walking, time in nature, massage etc. Those lyrics were written at a time when I wasn’t actually doing my music and it really was written about fear. It was fear of doing what was true to me, and finally overcoming that. “Once upon a time I was your fool, but nothing you can do will take me down.” That was the resolve that I felt once I moved beyond that resistance and released my music in the world. So I hope you enjoyed that song, you can hear the full song on my debut album, Thank You, which is available on all music platforms. And you can watch the music video above, which is really stunning. This I believe really is going to be one of the most important episodes that I ever do. In fact, this whole series I think is incredibly important. And this is the second episode of my Ayurveda Series 1. 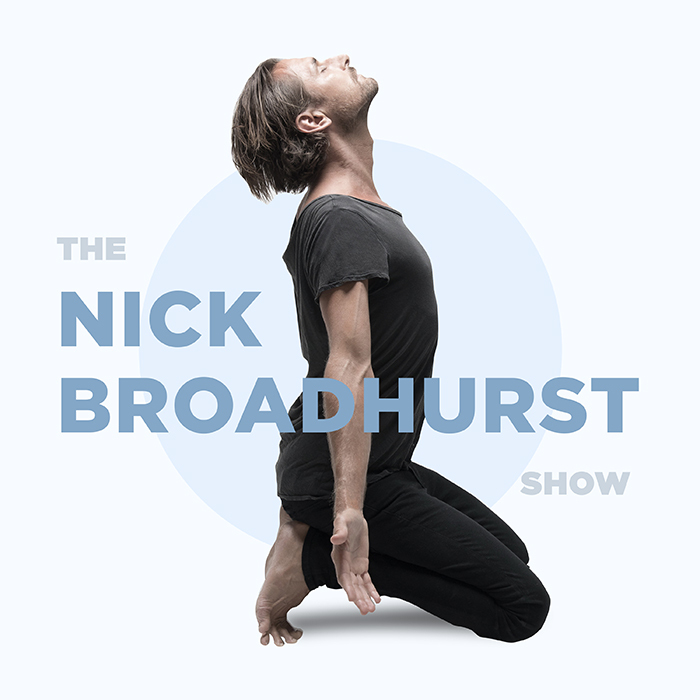 So if you haven’t heard episode 1 of my Ayurveda Series 1, go back and listen to episode number 21, which is at iamickbroadhurst.com/21. My goal with this series is to totally empower you to own your body type, and know how to take care of yourself and to optimize your health and well-being. This is information that has completely, completely transformed my life on so many levels. And while today’s episode is focused on the Vata body type, or the ectomorph, which is also known in the scientific world as an ectomorph body type, I’m going to give you a quick high-level overview of each body type before we jump into depth with Vata. So first of all, let’s look at Vata. Vata governs all movement in the mind and body. It controls blood flow, elimination of waste, breathing, and the movement of thoughts across the mind. So since Pitta and Kapha cannot move without it, Vata is considered the leader of the three Ayurveda principles in the body. Pitta governs all heat, metabolism, and transformation in the mind and body. It controls how we digest foods, how we metabolize our sensory perceptions, and how we discriminate between right and wrong. Pitta governs the important digestive Agni of fire of the body. And you would have heard me speak a lot about digestive fire and Agni. Agni really is just the word for digestive fire, which is something I’m always looking to improve as a Vata constitution. And Kapha finally governs all structure and lubrication in the mind and body. It controls weight, growth, lubrication for the joints and lungs, and formation of all the seven tissues, which is the mutative fluids, blood, fat, muscles, bones, marrow, and reproductive tissues. So as you can see that’s just a very high-level overview of each of the main three doshas, okay? But today we’re going to dive into the Vata, or the ectomorph, body type. And we’re going to look at this from a few perspectives; we’re going to look at it from appearance, and nervous system, weight, diet, and exercise. So I’m going to break it down into those things, and as you would have heard in my previous episode, number 21, my main predominant constitution is Vata, so I’m very much describing a lot of myself in this episode. But I also have a lot of Pitta in me as well. So let’s go through appearance; so the Vata body type is naturally thinner and leaner, so that’s definitely me. And I spoke yesterday about the blessing of being lean, naturally lean, but also the negatives that come with that which we’ll get into in a minute. Vata body types often have thin joints, so you can often look at someone’s wrists for example, and that’s a good sign of their body type. I have quite thin wrists, and thin elbows, things like that. Generally, have more of a flatter chest, now I’ve got quite a developed chest because I have some Pitta in me as well, so that’s where the Vata/Pitta comes in for my chest. They have smaller calves, and again, I’ve got quite decent calves, either from my high jumping years in basketball years or just because I have a lot of Pitta in me as well. But generally, Vata have smaller calves, a longer, thinner neck which is definitely me, and an oval-shaped face, which looks a bit longer than most, which again, is very much me. So that’s a general appearance summary for the Vata or the ectomorph body type. For the nervous system, this is really, really important, and not something which I hear spoken about a lot, but for me, this has been one of my big lessons, and that is; the Vata or the ectomorph operates in more of a catabolic based state, okay? So catabolic basically means “breaking down,” anabolic means “building up.” And I operate very much in that catabolic state, which means that the ectomorph or the Vata burns through a lot of fuel at an incredible rate. So whatever I eat through the day, I am going to burn that off; I’m going to use every single ounce of that energy. And it’s very, very hard for me to convert any of that into fat or body muscle unless I really, really work very hard and possibly eat way too much food that is actually healthy. And also the Vata body type operates in more of a high-stress state, more of a sympathetic nervous system type, and we really do want to try to spend more time in our parasympathetic, and I’ve spoken about this with different episodes about breathing techniques, things that can help us get into more of a parasympathetic state, which for me is incredibly important. Anyone out there who is Vata, it’s very, very important. But it’s important for all body types to try and operate as much as possible in a parasympathetic nervous system state. In terms of weight, as I said before, it’s very hard for the ectomorph or the Vata body type to put on muscle, even fat for that matter. So if I want to put on muscle, I need to, number one; I need to train smart, but pretty hard in the gym. And I need to eat a lot of food, and this is a sort of catch-22, isn’t it? Because the Vata body type has weaker digestion, so if you’re trying to eat way more food that is actually good for you, the digestion or the Agni is not going to be strong enough to break all of that down efficiently, which means you’re going to create ama, now ama is the word for basically toxins or undigested food, which in Ayurveda is considered the root of all disease. So as a Vata body type you have this sort of catch-22 where you do want to put on weight, do you do want to put on muscle, but you can’t eat too much because then you create disease, so it’s very tricky, very tricky, it’s a fine line. So naturally it’s very challenging to put on weight, and that makes it more challenging to put on any type of size, which is why in general Vata body types can eat a lot more carbohydrates than other body types. Okay, so that’s just a quick overview of weight. In terms of diet, as I said before, we can eat a lot more carbohydrates, and the ectomorph body type loves glucose; really, really, loves it, loves operating off glucose, which will be like a great sin to all the keto people out there. And I’ll get into that in a minute, but this is incredibly important for the sympathetic dominant nervous system Vata type, so, so important. Oh my God, this is one of the big things that I missed. And I learned my lesson, and I’ll talk about that in a minute. And as I said before, the Vata body type operates in more of a catabolic state, which means it breaks down more easily rather than building up. So, you can see just from that quick overview, you can see that there would be big problems in trying to prescribe one type of diet for all body types because right there you can see that the Vata body type needs carbohydrates for its nervous system. So keto, or low carb, is like total kryptonite to the Vata or ectomorph body type, and trust me, I know from firsthand experience. I’ve been there and I’ve gone hard, I have done full on proper ketosis, which very few people ever do. Most people just go low carb thinking they’re doing keto, and they’re not. I’ve measured my ketones, and I know that I was in ketosis for a very long time. And this felt good for a short while because my body was using less energy initially to digest food, but of course, starting a day with a bulletproof coffee, it’s going to give you a boost, but at what cost? For me personally, it completely wrecked my nervous system. It really put a strain on my gut health in a big, big way. Led to bacterial overgrowth, and it really hurt my liver and I could see that on my face. If you go back to my episode called, “Please be gentle with yourself,” I talk about a typical morning when I was in keto and how that felt, and the spots that appeared on my face, which was a clear sign that my liver was really struggling. And honestly, for ectomorphs or Vata body types going into keto would feel like you’re dying, that’s what I felt like. I felt like I was dying; I had no energy, I was angry, I was irritable, you know? Because I had no energy, there was no fuel, there was no glucose, which is really what the Vata, or the ectomorph, body type wants to run on. It prefers to run on that because it’s a more sympathetic based type of nervous system, and the glucose is needed to help bring down that sympathetic state. So for me, that was a really failed experiment going into low carbohydrate keto. It was one of the toughest periods of my life, to be honest. And again, I was doing bulletproof coffee and lots of red meat and this sort of stuff, and saturated fats are not my preferred fuel source. My preferred fuel source is polyunsaturated fats; I’m a “PUFA”; polyunsaturated fatty acids it stands for, which is things like olive oil, avocado, macadamias etcetera, but here I was smashing butter every morning in my coffee and having it on my food and cooking with tallow and all these sorts of things, and it was just not what my body wanted. And I’ve come to know this the hard way. And I’ve got to say; it’s really, really important not to compare yourself to anyone else. You can easily look at a friend of yours and go, “Wow, how come she has so much energy and clear thinking when she goes keto or low carb? What the hell is wrong with me?” The truth is nothing is wrong with you; it’s just not right for your body type if you’re a Vata or an ectomorph. Is that starting to make sense? If I look at Melissa, who’s more of a Pitta/Kapha, she does really well on low carb. She’s clear as a bell, she has heaps of energy, she wakes up fresh as a daisy, and it’s so frustrating to watch. I’m grateful that she has that of course, but don’t compare yourself to anyone else because body types are one of the few things that very few people talk about. But when you understand it, it totally transforms the way you look at yourself and the way you look at others. And as I said, my goal for this series is for you to completely own your body type. Another characteristic of the Vata is that they have very low body fat already, so if you go on keto or low-carb, you start to churn through muscle tissue, because you just don’t have the energy stored in the fat. Because when you’re going into keto, you’re starting to utilize more of your fat in your body for fuel, but you don’t have it, right, so as I said before, Vata and ectomorph do not typically do well on a low carb or a ketosis plan. I’ve got some questions coming through on Instagram Live; I would love to answer all those questions, but I have a lot to get through so I’m going to have to keep pushing on. So as I said before, my diet used to be a bulletproof coffee for breakfast, it used to be protein and non-starchy green vegetables for lunch with loads of added fat like butter and the same sort of thing for dinner. I was on less than maybe 50 grams of carbs per day and literally felt like I was dying. I couldn’t play with my son on most days, and I believe that the depression that I experienced last year was, from a physical perspective anyway, was largely due to wrecking my gut, micro ion, and really starving my body of glucose. Of course, I look back at that year and what I experienced, and I do think there were some physical things, but of course I also take a much more spiritual esoteric perspective on that and realize that I was going through a period of transformation and burning off a lot of who Nick was to become who I am. So it was a very important period for me, but if I just look at the physical part of that and how I contributed to that, going keto was not very smart for me. Now it’s the complete opposite; I now aim for more than 300 grams of carbohydrates a day, and I’ve never felt better. It took me awhile for my body to switch back to learning how to use glucose as a fuel source, and the first month was horrific. So they talk about the keto flu, when you try to go from a normal diet into ketosis, well going from ketosis back into high carb was even worse, and it required a lot of faith because I’d read so many books from Dr. McCall and Nora Gedgaudas and all these people which are totally valid for a lot of people, and there’s so much science out there around cancer and these sorts of diseases and going low-carb, but for me, it was literally killing me. So you can refer to iamnickbroadhurst.com/17, my episode “How to stop binge eating,” if you want to know more about how my diet looks in detail, but remember, don’t copy me. It’s taken me months and months to get this right, and it changes every week as my body gets more and more hungry for glucose, and as my body heals more and more. Because what happens is the body is going to use the fuel first and foremost for healing. I’m giving my body the space that it needs to heal first and foremost. Getting good rest, meditating, getting massages, doing saunas, swimming in the ocean, these sorts of things. So I’m making sure that I’m healing first and foremost. I’m not worried about my weight right now, I’m purely concerned with letting my body heal. And then from there, once the body has gone through that healing process, it starts then to go back to homeostasis and start to put the weight back on, start to build more muscle again. So that’s kind of where I’m at right now, my body is putting weight back on, I’ve put on 5 kilos literally in the last four weeks, which means my body has shifted back into a more anabolic state and less catabolic. And when I was in keto, I was very, very catabolic. Okay, let’s shift to exercise. As I said before, the Vata, or ectomorph is nervous system dominant, which means that the strength comes from the nervous system. That translates as being able to lift a lot of weight, but generally at the expense of their nervous system. You don’t do well with very high intensity or longer exercise sessions. You want to be doing, or you don’t want to be doing heavy, one-rep max’s, or heavy three by five, high volume training, etcetera. Things like ten sets of ten is a nightmare because anything which is a nervous system type of training is going to wipe out your nervous system. So just to reiterate, heavy one-rep max’s, or three by five, or a very high volume training, ten by ten, is going to wipe you out. So it’s best to stick with high-rep workouts like ten to fifteen reps, but maybe three sets, so you’re not in that nervous system based strength, does that make sense? So the other thing is, you want to rest between sets, and you want to get lots of sleep. And you never, ever want to go to failure. Going to failure for Vata or ectomorph is just going to burn you out; it’s that simple, I’ve made this mistake. So in general, you’ve got to be very gentle with your body if you’re a Vata or ectomorph, and so for me personally, I train with weights three times a week, and I balance that out every other day with yoga and walking, because that puts me back into a more parasympathetic state; it calms the nervous system. And it’s really, really fantastic for the ectomorph to stretch after workouts, that really helps bring the nervous system back down into a calmer state. And just remember, the Vata and ectomorph is supposed to be naturally leaner, so if you’re trying to be massive, you can get there, but there’s going to be a cost to pay, and I’ve paid it. Because if you look at some of my previous videos like, “Little Lover,” I was a lot bigger, and I might have looked good, but I didn’t feel good. So if you want to pack on some muscle and some weight, sure you can, but be very, very careful that that doesn’t come at the detriment of your health, and just make sure you’re eating more carbohydrates through the day and you’re timing your pre and post workout nutrition very, very carefully because that is so, so important. And remember, carbohydrates soothe the nervous system; they bring cortisol levels back down, so, so important. If you’re ever stressed, it’s no wonder that you reach for the tub of ice cream, or the pasta, or the rice, or whatever it is, the sweet potato, because your nervous system is just craving being soothed. So as you can see, this body type comes with its challenges, but also its positives. Will you ever be massive? If you’re a male and you want to be big, possibly, but at a cost; if you’re a woman and you want to stay lean, being a Vata ectomorph is a blessing because it’s naturally your state, but it comes with its negatives. Your immune system is weaker, okay? Your ability to withstand stress is less; you’re less resilient. So there are positives and negatives to both. And I wish I had more of Melissa’s Kapha and Pitta, which is the strength and resilience, but I don’t, so I now know that I have to balance my body out accordingly, it’s that simple. So enjoy your beautiful lean body if you’re Vata ectomorph. And a good mantra for you is, “Don’t push.” Don’t push, just slow down, that’s my mantra. So I hope you enjoyed that, that is the second episode in my Ayurveda Series 1. And you can get all of the show notes at iamnickbroadhurst.com/22 and the full transcript of the show. And I’m so excited to be sharing this information with you, it’s so, so important. Honestly, I feel honored to be able to have this information and once again, I thank all of my mentors who have taught me so much on this topic. I by no means am an expert; I’m just like you, someone who’s trying to do their best in life, and I feel like I have figured out one part of the equation, which is determining your body type and learning how best to use that to your advantage. THANK YOU! From the bottom of my heart. I have the same experience as you, ignoring my intuition on my healing journey and listening to advice coming from here and there telling me to eat all the fats and cut out the carbs. I was an emotional wreck, feeling like I had constant PMS, when I at the same time ironically lost my period following this advice. I lost way lots weight and my gynecologist suggested I started eating some more carbs in order for me to get my cycle back. And oh my, my emotional state transformed so rapidly when I increased my intake of carbs but at the same time I felt guilty for doing the \\\”wrong\\\” thing as I had dug so deep into the all of the advice with all the latest hypes of the lowcarb and keto-suggestions. I certainly know many people who thrive on eating way more fats, and now I realize they do have a different body type than I do, and it is all about embracing that and honoring who I am; truly, from the inside out. Seeing myself as unique in every possible way and also honoring and respecting that in the other. Oh my! This is so good; I am going to share this to everyone I know. I would love if you could continue this series in ayurveda with maybe inspirations to what foods are beneficial for each type, and also more on the spiritual aspects of it. For instance I now understand why my daily meditation practice is sacred and how I can feel and notice a world of difference if I one day miss it (which I now, basically never do, because it really is that important). I can not thank you and Melissa enough for your valuable work, and I am now definitely going to the bookstore to get Open Wide, The Way Of The Superior Man and the Paleovedic Diet!